I’ve mentioned in previous posts that I’ll be speaking and facilitating at the Open Leadership Symposium in Boston on May 14th-15th and leading a masterclass (a 2-day Agendashift workshop) afterwards. If you’re wondering what the fuss is all about, here’s my personal take on something very exciting that is still in the process of emerging, for which the conference represents an important milestone. [Relative to the branded Agile process frameworks, the term] Open Social Technologies represents a much broader, more diverse, and still complementary array of frameworks that address a range of organisational concerns in ways that the process frameworks simply cannot. Not only are they well documented, they share substantial parts through open source, Creative Commons, and similar mechanisms (including release into the public domain), to the extent that a suitably-experienced practitioner could with effort reproduce and even improve on it, without necessarily licencing whatever conveniences might be available to them on a commercial basis. They’re open not just to extension (a natural property of any framework) but also to modification and replacement, something that many branded frameworks actively discourage. To be truly open, there must be no mandated practices; instead an attitude of “core or better”  prevails, enabling both local adaptation and community-driven innovation. They are highly sensitive to context, portable from one social or organisational context to another, producing perhaps radically different outputs according to the situation. To achieve this, they’re generative, such that outputs are generated, organised, prioritised, and developed by participants – predetermined neither by the framework nor the facilitator. As social tools, they help people to work together, empowering them with decision-making authority, building social capital up, down, and across the organisation and beyond its four walls. This describes both how they work when they’re being used deliberately and the kind of organisational legacy they tend to leave behind. For the engagement models in particular, this internal consistency is an explicit design goal, one that contrasts sharply with the dissonance and disengagement too easily triggered by traditional approaches to change. 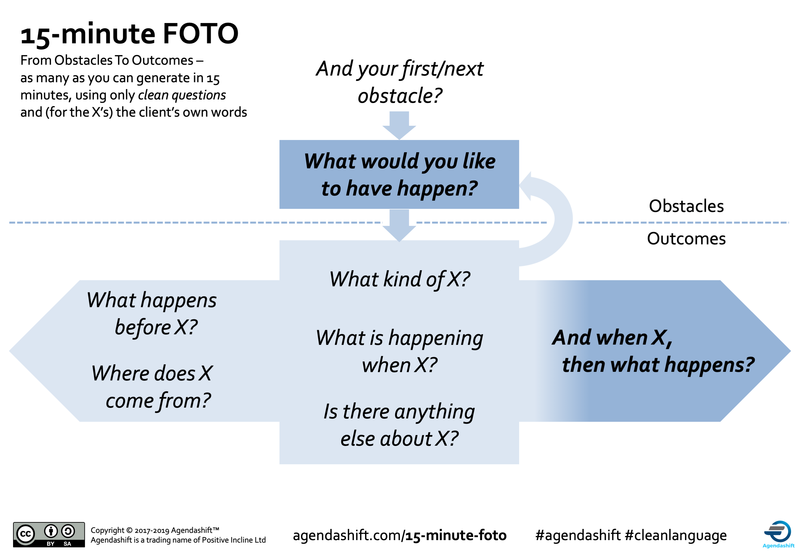 Clean Language , which via Agendashift or on its own is valued by parts of the Lean-Agile community as a coaching protocol. Its heritage however is in psychotherapy – a powerful demonstration of the portability and sensitivity to context described in point 3 above! The conference brings representatives of these frameworks (and more) under one roof for the first time, and that is surely cause for excitement. We have a programme not just of talks but hands-on workshops also, not to mention the pre- and post-conference masterclasses of which mine is just one. Who knows what might happen? To be honest, I don’t think anyone can be sure, which makes it an event not to be missed. Further information about the conference can be found here; sign up to the masterclasses here. See you there! 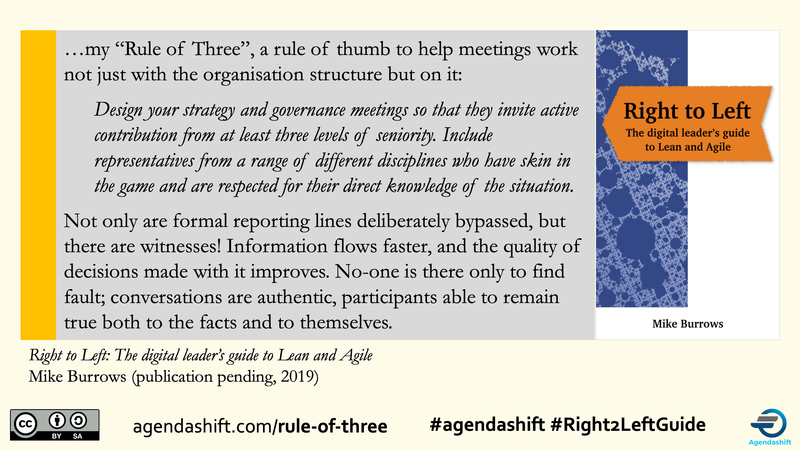 Exciting news: as of last night I have a complete draft of my third book, Right to Left: The digital leader’s guide to Lean and Agile. Not that “complete” means “finished” – as the old joke goes it’s more like 95% complete with only the remaining 50% left to do. For the record, it comes out at 40,685 words – just a tiny bit longer than Agendashift and way less than KFTI. I’m not giving publication dates yet (in fact I’m still exploring publication options) but my original target of midsummer still looks very doable. Also, I’ve consciously written it with the possibility of releasing it as an audiobook, which would be a first for me. An amazing response to this month’s top post, Stringing it together with Reverse Wardley, pushing My favourite Clean Language question into second place for the year. For the 2-day workshop, introducing the new exercise as part of a “string” of exercises – one feeding quickly into the next – has caused me to push one exercise from day 1 to day 2, improving the balance of the two days overall. To experience that for yourself, check out the calendar later in this post. At the end of that webinar there’s a plug for the Open Leadership Symposium event happening in Boston in May (my Boston workshop follows immediately afterwards). I’m very excited about this event, a lot of streams coming together. More on that soon no doubt!